Visit our SERVICE NEWS page for the latest Service-Affecting News and Information! *Sun Outages can be expected from 2/28 through 3/7. Click the Service News page for more info! MOBILE APP – Control your DVR from your smartphone! WEB ACCESS – Control your DVR from your computer! * If you are using a mobile device, you will be asked to download the channel app instead of viewing through a website; follow the prompts to download the channel app and sign in. From then on, you can simply open the channel app to access the channel. For further assistance or for remote/receiver combinations not listed here, contact TCC and we will be happy to assist you! Twice per year, cable and satellite tv subscribers experience “sun outages” on certain channels. This happens when the earth’s orbit puts the sun directly in line behind the satellites that provide signal for certain tv channels. The sun’s solar radiation interferes with the signal, causing outages. The outages typically last about 15 minutes and occur during the middle of the day. Sun outages happen in the spring and again in the fall. Unfortunately, there isn’t anything TCC can do about this – as it is happening to the programmers we get our content from. Contact TCC if you have any questions. 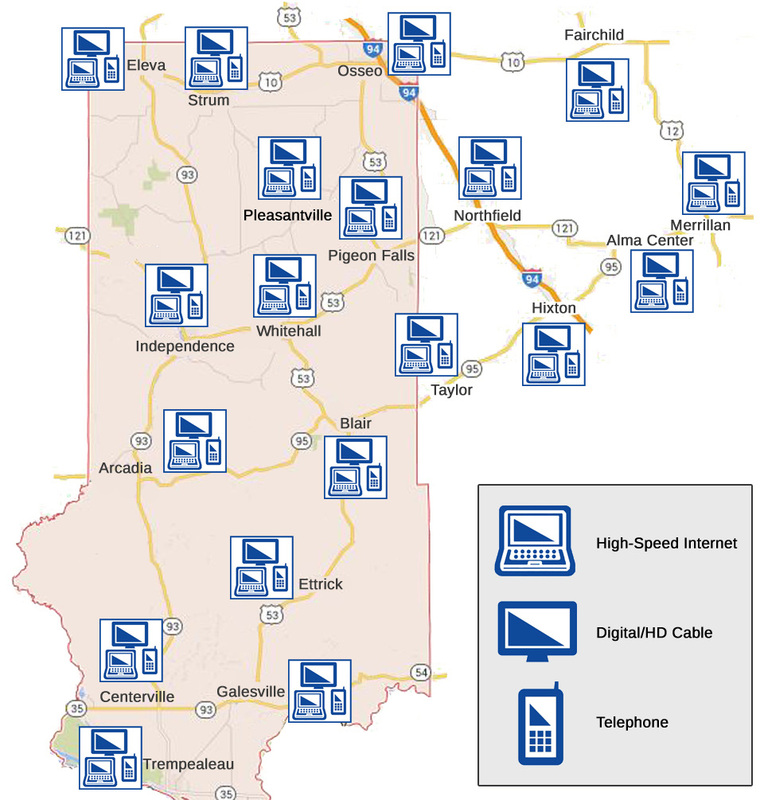 TCC serves the following communities with Cable TV: Alma Center, Arcadia, Blair, Centerville, Eleva, Elk Creek, Ettrick, Fairchild, Galesville, Hixton, Humbird, Independence, Merrillan, Northfield, Pigeon Falls, Pleasantville, Osseo, Strum, Trempealeau, Whitehall. Click/touch map for larger view. Cable services provided by WWC, LLC – a TCC company.